The Wisconsin Policy Forum is a nonpartisan, independent statewide policy research organization with offices in Milwaukee and Madison. Our mission is to provide informed, nonpartisan analysis of critical policy issues affecting local governments, school districts, and the state of Wisconsin. Our research and facilitation activities encourage elected officials and community leaders to find effective, data-driven solutions to pressing policy challenges, and promote productive discussion among the public and private sectors. Join hundreds of corporations, nonprofits, local governments, and school districts and more than 1,000 individuals who ensure the Forum’s continued operation as a valuable and reliable source of independent, nonpartisan government research and education. Our events include in-depth policy discussions featuring knowledgeable speakers and panelists encompassing a wide range of perspectives on a variety of timely topics. 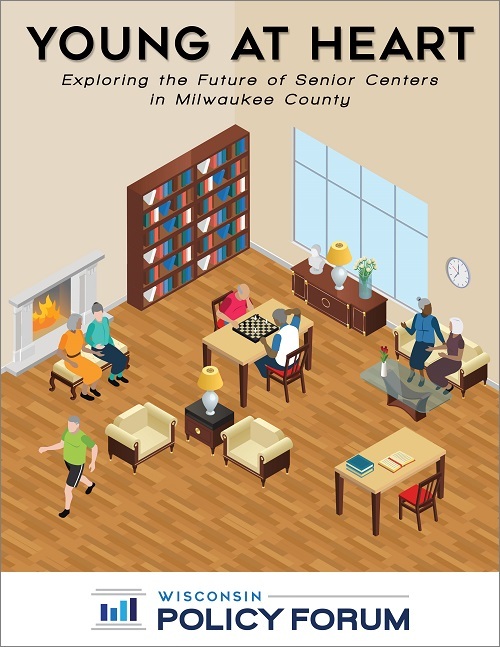 Our latest research finds that the five Milwaukee County-owned senior centers face substantial repair and replacement needs, which poses a particular challenge given the county’s overall backlog of needed infrastructure projects. At the same time, these facility needs offer an opportunity for Milwaukee County officials and the broader community to re-assess the role of senior centers. Should Milwaukee County own and pay for programming in large facilities that are exclusively devoted to older adult services? Should Milwaukee County consider, instead, the use of multi-generational community centers in the hope of expanding the benefits of such facilities to the broader community? "The Forum continues to demonstrate that fact-based research and civil policy discourse still matter in Wisconsin."